Are you having trouble singing songs? Can you practice scales and singing exercises, but can’t put what you’re learning into practice with an actual song? In theory, singing itself is a very simple process of pressure, vibration and resonance – but learning how to sing effectively can be a frustrating and confusing process. It’s okay though, there’s light at the end of the tunnel! Learning how to sing a song is easy when you learn the simple process I’m about to share with you. Before we get started, let’s look at the standard learning curve for singers. The first stage of singing is often the most exciting and exhilarating part of the learning curve, and with the basics like breathing and resonance alone, you’ve likely seen some progress in your singing – which is really cool. Unfortunately, this often leads directly into the Stage 2 rut, where every step forward starts to feel like five steps backwards, leading to frustration, confusion and desperation. Out of this desperation, many singers stuck in the Stage 2 rut branch out and buy more course, and buy more singing lessons – ending right back in the same rut with each different method. Finally we have Stage 3, where singing becomes a true joy punctuated by extensive range, an impressive tone and the ability to sing any song you’ve ever dreamed of. Let’s face it, Stage 3 is often reserved for those who were already gifted singers to begin with. As you can see this isn’t a very effective way to learn how to sing, as well as a totally inefficient learning curve – fortunately there’s a better way! 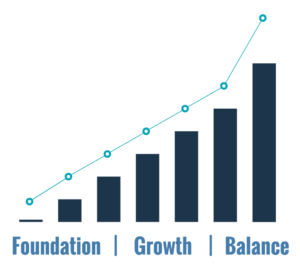 By replacing this inefficient learning curve with Foundation, Growth and Balance instead, you’ll notice that the learning curve becomes much more proportional between the ongoing progress that you see with the amount of time, effort and training you invest in your voice. By setting up a strong Foundation first by developing a working relationship with each individual aspect of the voice; vocal onsets, resonance, vowels, range, tone – you will set up a bullet-proof concrete base for your voice to be built upon. After you’ve set up a rock solid foundation using the Foundation 101 singing course here at Bohemian Vocal Studio, you can start building strength, extending range, improving tone and developing control an finesse in each important aspect of the voice from high notes right through to power and intensity. 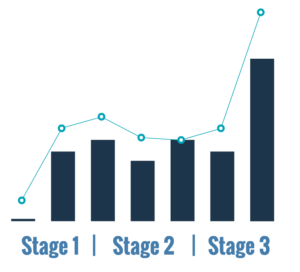 Now, the Foundation and Growth stages lead directly to the Balance stage of singing which replaces the former ‘click’ of Stage 3 that was only available to very select few singers with the standard vocal learning curve. The Balance stage of singing where range, tone and power all become easy and consistent is available to EVERY singer that invests the time and effort into their voice using the Foundation, Growth and Balance approach to singing. As you can see, this is a much more efficient way to learn how to sing, and will ultimately allow you to learn how to sing a song – ANY song in fact, you could dream of. If you’re ready to get started with this powerful vocal approach by setting up a rock solid foundation, a great place to start is this Exclusive Singing Lesson which will show you how to sing with mixed resonance while connecting your chest and head voice. If you have any questions about singing a song, feel free to leave any feedback or questions below!